"Whoa" has always been "whoa," although I'll admit to pausing before I type it - funny, because I grew up with horses and verbalized it a lot. 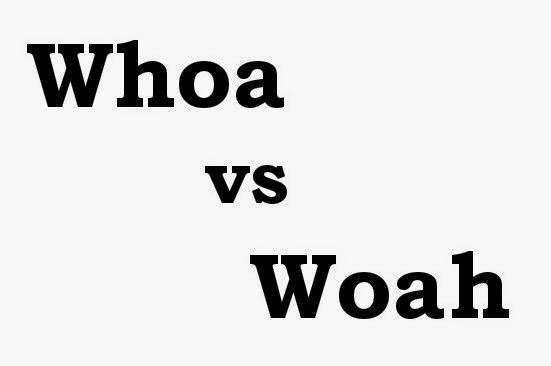 When one says "whoa" in astonishment, that's like saying "stop, just a minute," which is, techincally, what "whoa" means in the horse world too. As for the "y" words you mentioned: yeah = yes, yay = yippee, and yah = yes, in some dialects. What irritates me is when someone says "yea" meaning yeah, or yes. "Yea" is actually old English and pronounced as "yay." So, yeah... Another common misuse is "awe" for "how cute" versus it's actual meaning, "in awe of," as in respect. So yeah, again - there's my two cents!